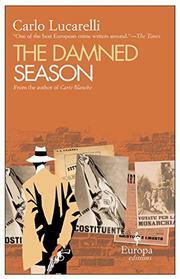 Crusty Commissario De Luca gets drawn into a murder investigation in spite of himself. Traveling incognito to Rome in 1946, Milan detective De Luca is accosted by enthusiastic Ravenna police chief Leonardi, ostensibly because he looks so out of place. Despite brand-new papers that identify him as Giovanni Morandi of Bologna, De Luca is shuttled by Leonardi to the scene of a recent bloody crime, a house where an entire family was bludgeoned to death. Leonardi stops short of blowing De Luca’s cover, but he tells a nostalgic story about once seeing the inspiring Milan inspector De Luca at work. After Leonardi dubs De Luca “Engineer”—as good a tag for him as any other, he declares—the unlikely duo sets out to investigate. Part of De Luca’s low profile stems from a fear of reprisals for his involvement with Italy’s recently deposed dictatorship. Still, at his core, the sleuth is a sleuth and can’t resist trying to unravel the crime. On his initial visit, he points out subtle anomalies in the crime scene. The interaction between the eager acolyte and the erratic but brilliant mentor forms the heart of the novel, with De Luca’s excessive drinking and his affair with lusty local innkeeper Francesca providing unforeseen hurdles. The middle entry in Lucarelli’s early trilogy (Carte Blanche, 2006, etc.) peppers crime fiction with sharp irony and provocative moral ambiguity.